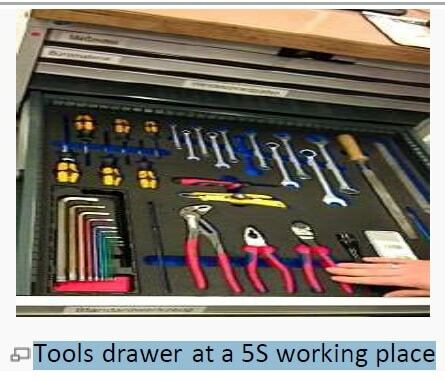 5S is the name of a workplace organization method that uses a list of five Japanese words: seiri, seiton, seiso, seiketsu, and shitsuke. Transliterated or translated into English, they all start with the letter “S”. The list describes how to organize a work space for efficiency and effectiveness by identifying and storing the items used, maintaining the area and items, and sustaining the new order. The decision-making process usually comes from a dialogue about standardization, which builds understanding among employees of how they should do the work. The 5 S’s: There are five primary 5S phases: They can be translated from the Japanese as Sort, Systematize, Shine, Standardize and Self-Discipline. Other translations are possible. Other phases are sometimes included e.g. safety, security, and satisfaction. These however do not form a traditional set of “phases” as the additions of these extra steps are simply to clarify the benefits of 5S and not a different or more inclusive methodology. The phase, “Safety”, is sometimes added. There is debate over whether including this sixth “S” promotes safety by stating this value explicitly, or if a comprehensive safety program is undermined when it is relegated to a single item in an efficiency-focused business methodology. The phase, “Security”, can also be added. To leverage security as an investment rather than an expense, the seventh “S” identifies and addresses risks to key business categories including fixed assets (PP&E), material, human capital, brand equity, intellectual property, information technology, assets-in-transit and the extended supply chain. Techniques adapted from those detailed in Total security management (TSM) or the business practice of developing and implementing comprehensive risk management and security practices for a firm’s entire value chain. 5S was developed in Japan and was identified as one of the techniques that enabled Just in Time manufacturing. Two major frameworks for understanding and applying 5S to business environments have arisen, one proposed by Osada, the other by Hirano. Hirano provided a structure for improvement programs with a series of identifiable steps, each building on its predecessor. As noted by John Bicheno, Toyota’s adoption of the Hirano approach, was ‘4S’, with Seiton and Seiso combined. However, Toyota now uses the 5S as a standard. Although the origins of the 5S methodology are in manufacturing, it can also be applied to knowledge-economy work, with information, software, or media in the place of physical product.